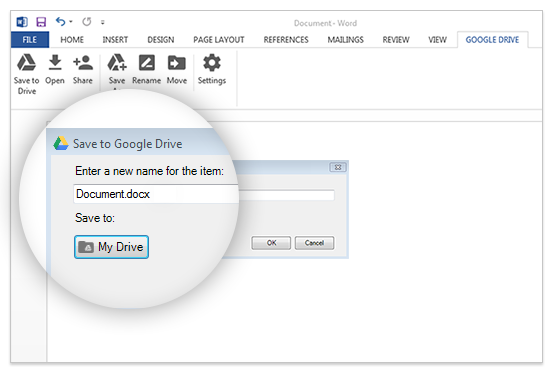 Google recently released a Drive plugin for Microsoft Office that allows you to open files from Google Drive directly in Microsoft Office, without the Google Drive sync client. If you're a Drive loyalist who happens to love using Office, this tool can make your life easier! The plugin makes it easy to edit Office files stored in Google Drive so you can use the apps that you're already comfortable with. This is especially useful when sharing files with others or accessing your files across devices. Google's idea here is to continue to make Drive into more of an integrated storage tool for its users. Alternatively, you can just use Google's desktop application for Drive to sync locally stored files with Google Drive already, but the new plugin makes this a far more seamless experience for Office users. The set-up is quite simple and familiar: anyone running Office on Windows can now open Word, Excel, and PowerPoint documents stored in Google Drive, edit them locally in Office apps, and then save any changes back to Drive. This will allow you to keep all your important files in one place, without needing to have a dedicated folder on your computer that syncs everything to the web. If you have a slow or unreliable internet connection, this plugin can help smooth out the bumps by only syncing what you're currently working on, not everything that's changing behind the scenes. Early last year Microsoft announced that it was ending support for Windows Server 2003 but would continue to provide extended support for some additional time. We addressed this in an older post and pointed to an alternative solution, Google Apps. Last week, Microsoft announced its discontinuation of extended support for Windows Server 2003. So what does this mean? It means Microsoft will no longer provide fixes, updates, or technical assistance. This also means no more security updates, leaving physical and virtual instances vulnerable to any and all new security threats, which have been increasingly damaging. Businesses that are still running Server 2003 face a number of vital considerations. It’s been over a decade since its release and the computing world has changed drastically since. Although the Windows Server 2003 platform worked well in its time, it’s now become a liability and a limitation for organizations still relying on it. Waiting to upgrade is both expensive and risky as you’re now susceptible to security threats and paying hefty fees to maintain old hardware. It's now time to leave the obsolete server and update your business' infrastructure. Leaving Windows Server 2003 is an opportunity for change. So where do you go? Windows Server 2012 R2, Microsoft Azure, and Office 365 are all concrete solutions with great benefits, including improved performance, reduced maintenance requirements, increased agility and speed of response to business. Microsoft recommends collaborating with a partner to help execute a successful migration strategy. We have, not one, but two Microsoft Silver Competencies and are here to help you! Alternatively you could step into the Google infrastructure and perhaps find that it's better suited for your specific business needs. You now know that you are at the end of your Windows Server 2003's life cycle, contact us today to pave your way to a successful and permanent migration to the cloud! Migration is worth it!